Ah it has been quite a productive week at my house! Ok, well at my MIL's house! I have gotten a ton of homework done, and This is some of what I made! 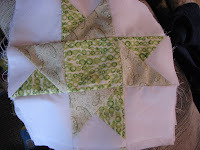 -quilt squares for a lady on our foreum that was pregnant and had a weird condition where they thought she was having twins and the baby died and she is still in the hospital- 1 for each of her 8 kids and 1 for her! (We are all pitching in squares!) 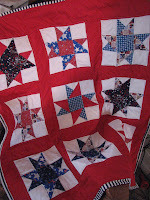 baby quilt for my red, white and blue swap!!! I LOVE it! Don't worry about teh paypal collections. It's no big deal. You Rock!!! What happened? Why did she send you to collections? Where does she live? We should go after her evil face. If you want to drive to Alberta Erin, well then give me a call! lol hahaha! I'm on my way with a bat in hand!